Thank you to the publishers for this review copy and for the opportunity to meet and chat with Hallie in London last month. 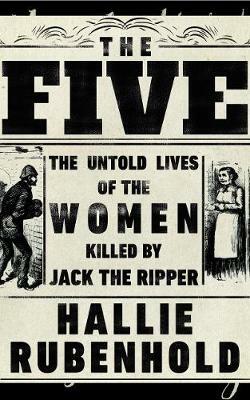 This book is a real eye opener in so many ways, firstly of course in the status of the five women associated with Jack the Ripper but also in the history and circumstances of their lives and general lives of this time. I won’t include specifics in this review but I have learnt so many things from reading this that it has been a very valuable experience. So to reflect on the book which I am quite sure I will for a long time to come…. the roles of the press, the attitude generally to women by everyone, the life they were subjected to often as a result of the decision made by a ‘husband’. Then you consider how much has changed since then, how much has not changed at all? What has improved? How many people in the UK and World could still be living such a life. A real eye opener that I urge all to read and consider. Very happy to recommend this to all, thank you. As soon as I heard about this book I knew I had to have it. Jack The Ripper is someone that most people have heard of, some may have even taken one of The Ripper tours whilst in London, but not many could name his victims. This book explores these 5 women in great detail. The Five was a difficult read for me, I wanted to put it down but also wanted to keep on reading all at the same time, this was not a work of fiction and Hallie Rubenfold has done an amazing job of making us understand the lives of each of these women. These women were victims of a horrific crime and this book gives each of them a voice, at long last.